Just a quick post since I'm late creating and posting my card for the Mojo Monday 189 challenge. If you're interested in the details, e-mail me or comment. I left my sheet in my studio and am in such a rush to meet the deadline! Needless to say, I used Verve stamps ;-) And yes Julie, the twine is "Caribbean" from The Twinery!! Take care and thanks for stopping in! Silly me. I finished this card last week and forgot to post it for the challenge! It's down to the wire, so here goes! I fell in love with this paper and just HAD to make this card. I've seen this ribbon treatment around, and thought it would be perfect for this paper and this particular card. All of the stamps are from JustRite....naturally! The die templates are Spellbinders....naturally! And that pretty little bling circle around the sentiment is Close To My Heart.....naturally! 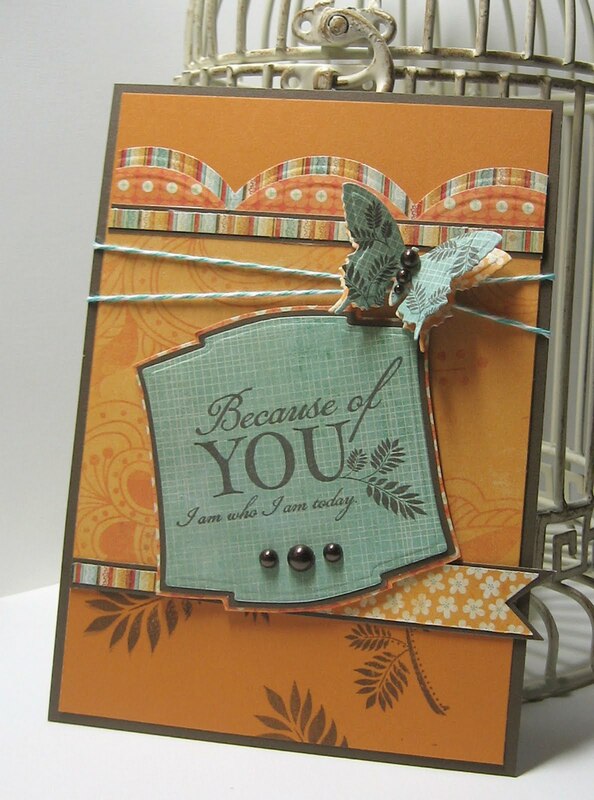 JustRite's challenge 51 is to make a card for to thank someone who was kind to you, or a project as a random act of kindness to someone. I think I know just who will receive this card from me! Can you believe there is only one day of March remaining? 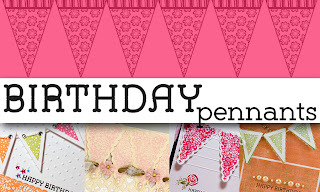 Spellbinders/Flourishes Birthday Pennants Blog Hop! Flourishes and Spellbinders(TM) have teamed up for a blog hop to introduce the cutest ever stamp set from Flourishes, made just to coordinate with our awesome-est Nested Pennants dies! Are you ready to take a peek? 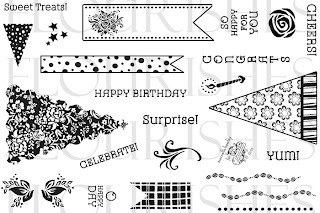 This fun set just screams celebration and offers six different pennants and flags all designed to coordinate perfectly with Spellbinders S5-028 Nested Pennants and Spellbinders S5-029 Nested Lacey Pennants. There are also nine sentiments and eight accents in the set that you can use to deck out your pennant shapes in fun and different ways! 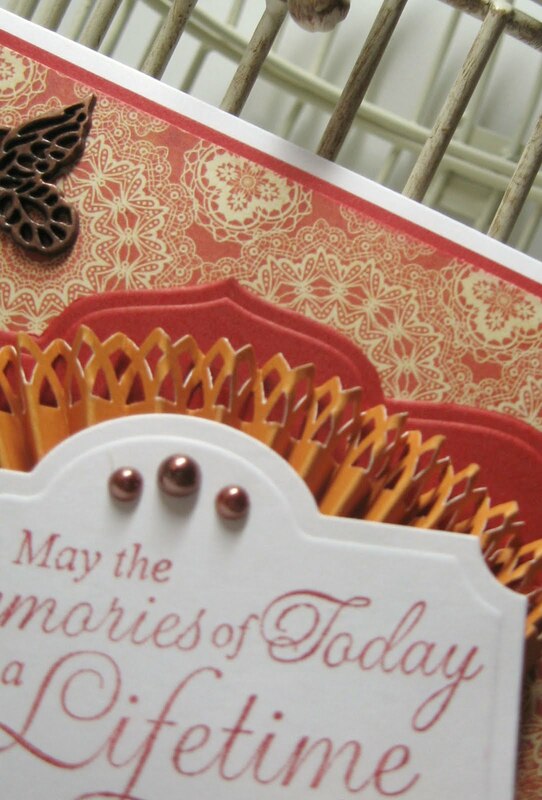 Want a little more to coordinate with your cards? 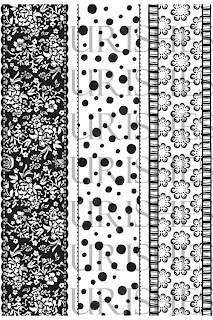 How about the new Strips and Stripes background set from Flourishes? This set offers three strips to use together as one background or separate as three different strips that coordinate with the Birthday Pennants set! Since the set was just released last night, I can show it to you now! 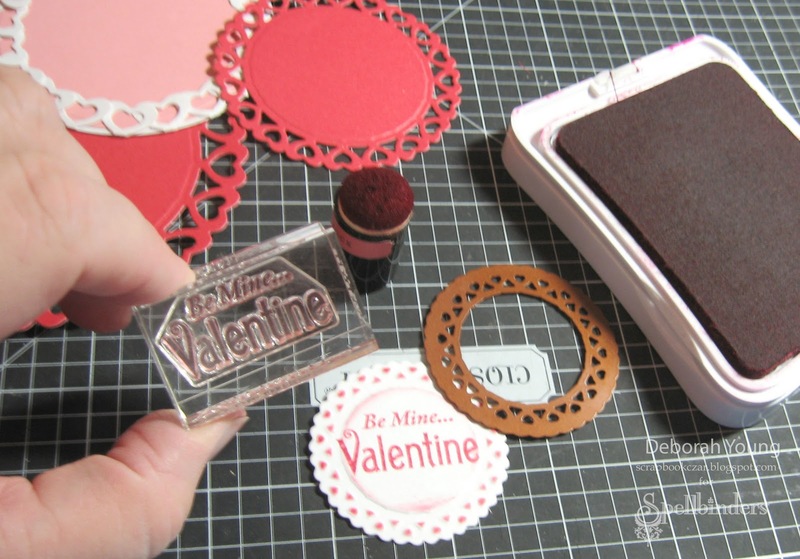 I had so much fun with these stamps and die templates that I created two little projects for you today! I used one of the pennant stamps for the banner, and one of the little flag stamps peeking out from the right side of the photo. The Strips and Stripes are used to create a mat for the photo. Sweet! A little butterfly anchors the journaling tag, which is another nested pennant. You can click on the photo to enlarge it. 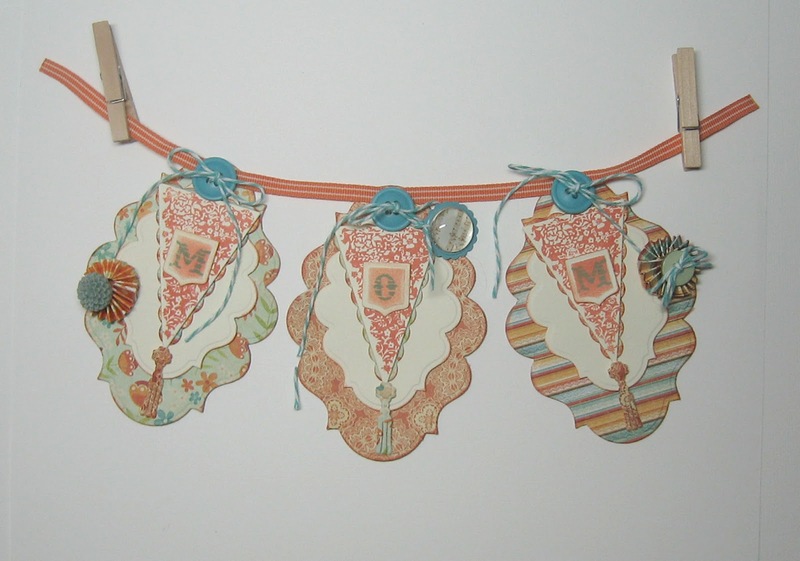 My second project is an adorable little banner that I will use to anchor a layout featuring my beautiful Mom! I cut the bottom layer with chipboard (Diet Dr. Pepper box!) and paper. 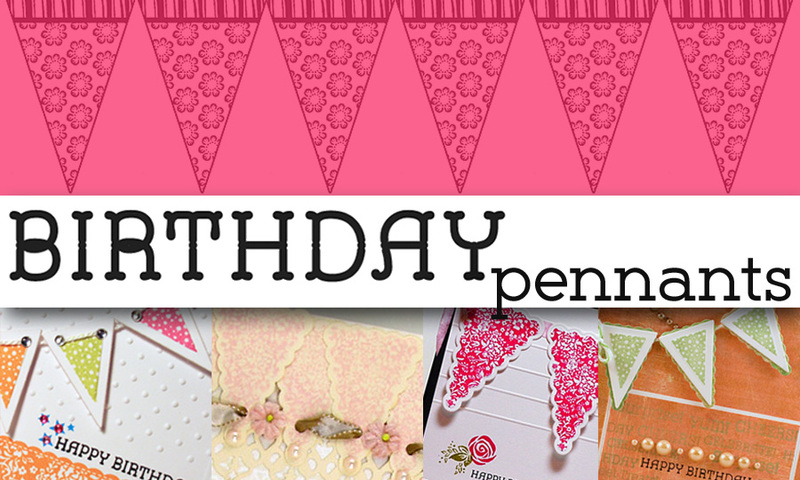 I used a different pennant stamp from the Birthday Pennants set - just love this one! Everything is mounted on foam squares for extra dimension (see below). Would you like to win these sets? Just leave a comment here on this post! 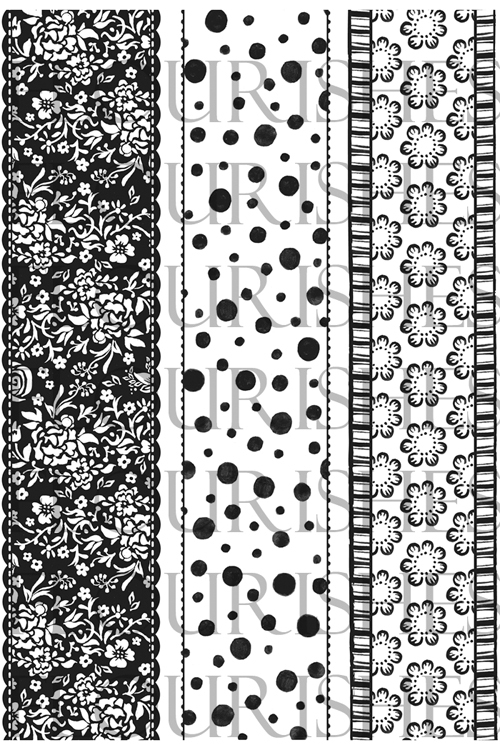 We'll draw one lucky name for both sets and announce it tomorrow on the Flourishes blog! We lost my dad five years ago last week. It seems like it was yesterday, and it seems like a lifetime ago. 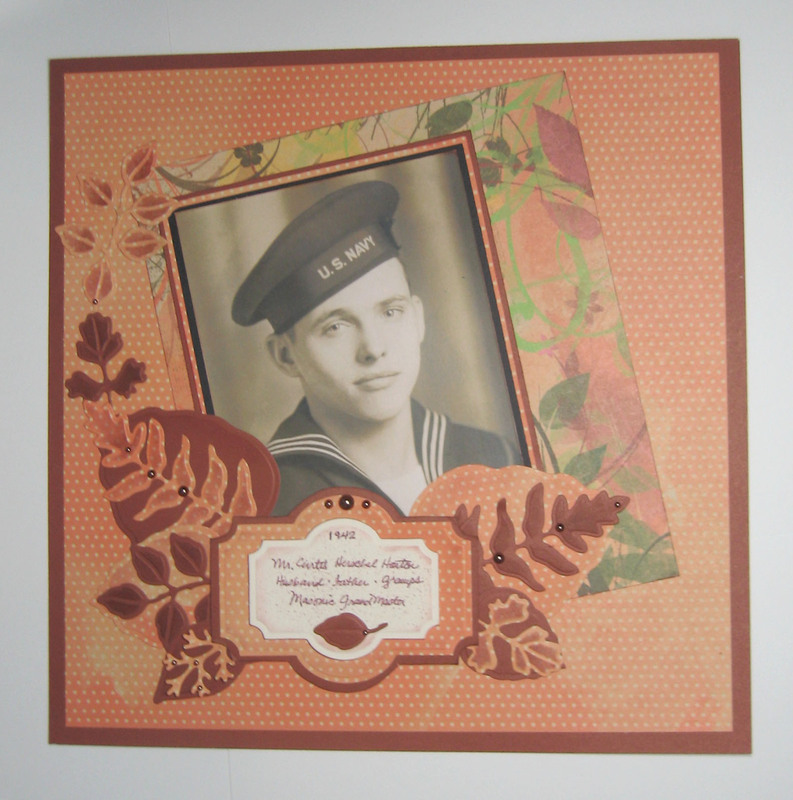 I created this layout featuring my favorite photo of him from when he was a baby in the Navy. How handsome, right? This layout was for a design team contest (I was not selected), but I love the layout, and that's what counts. I hope you enjoy it! Happy Friday! Woohooo! Do you have Super-Bowl-watching plans this weekend? I just spoke with my buddy Butch in St. Louis. It will be his last supper, so to speak, as he is starting the South Beach diet on Monday. We're going to try to encourage each other to lose a little weight. I only wish I just had 25 pounds to lose like he he does! Well, one step at a time, right? Here's a card I made in December (last year - tee hee!) for the Humble Artists' Group swap that I am in. 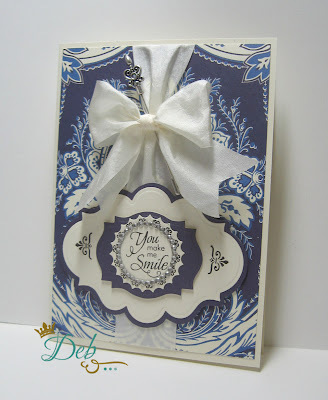 I just can't stop using my Spellbinders(TM) Grand Labels Four die templates for cards! 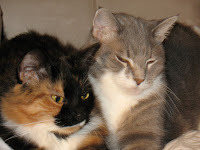 See how nicely they nest together? I used the largest for the card base, then the next one for the blue paper. Then I cut the center out of the blue paper, flipped it over to the light brown side and used that inside the card! Don't you love that little peacock? I should have taken a photo of her before I mailed off my cards, but I didn't. I inked her up in green, then added some blue with sponge daubers, plus a few sparkles on her crest and feathers. I'm itchin' to craft, so I think I'll retreat to my humble studio. Confession time. It seems that any time I try to do shabby chic, it turns out more shabby than chic! More of a hot mess! But it doesn't stop me from trying - tee hee! So I thought I'd try again. 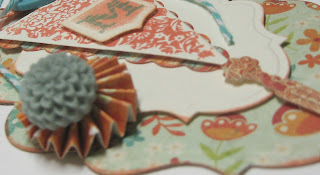 I pulled out a bunch of Spellbinders(TM) die templates, some stamps and embellishments, and went to work. 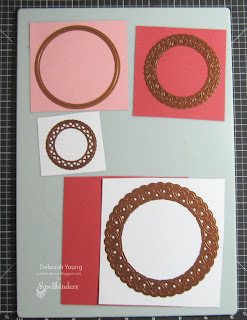 I started with a circle card base from CTMH. 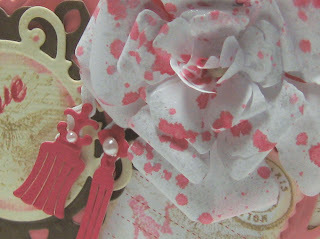 Then I background stamped the entire base with a music stamp from House of Three. I used plain white copier paper to make the rose, then splattered it with two colors of misty paint. I really love that Rose Creations set! 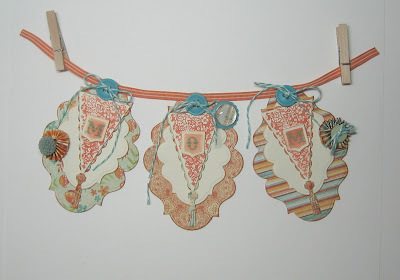 And I really love the little tassels from Banner Basics Two! I'm determined to learn to 'do' shabby chic! I have a hard time knowing where to stop - ha! But I think it's good to depart from your style occasionally, don't you? Be sure to stop by the Spellbinders Blog this Thursday. I made a mini-album using the newest Creative Book Pages that will be featured, complete with instructions! 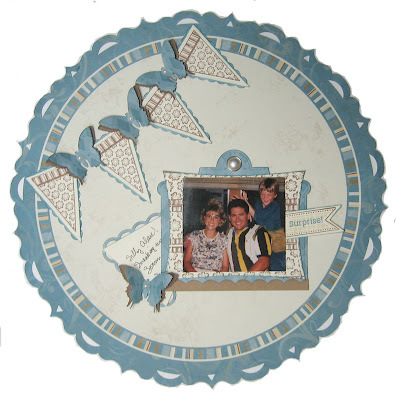 Congrats to the winners of the Spellbinders(TM) "To Die For!!" 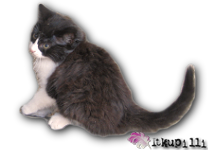 Blog Frenzy! Oh, you are going to looooove your new toys! Thanks again for all of your sweet comments. I wish everyone could have won! Someone asked about the cupcakes in my post- yes, they were delish! ha! They were actually store-bought from Walmart, but heavenly nonetheless! 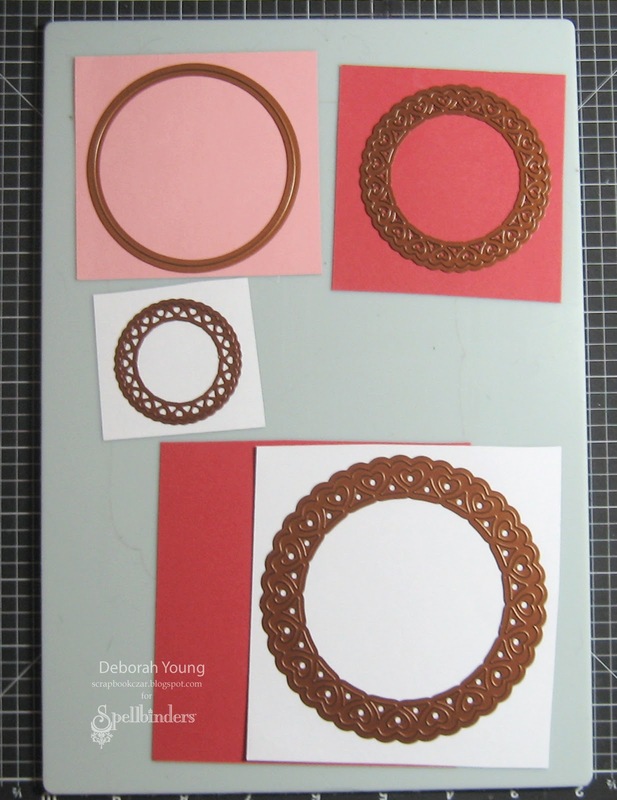 I thought I would share a couple of my Spellbinders' layouts that are ready for public viewing - tee hee! 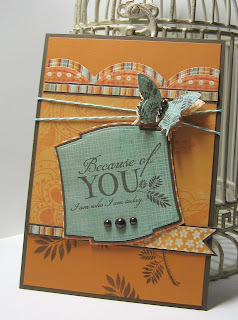 I created these months ago, but needed to wait until they were in the Spellbinders' blog gallery. Click on the link to see the design team's monthly artwork. 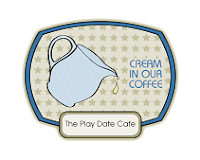 Projects with even more new die templates will show up after CHA next week! The first layout uses some awesome double-sided cardstock paper from My Mind's Eye. You can click on the photos to enlarge them. It's a photo of my son and my dad way back when Alan was around two - probably 1990. Alan was reading a book and Gramps was reading the newspaper. Sweet! So I journaled on a little 'book' that I made with Spellbinders' die templates. Why not? This is the first layout I made with the Grand Nestabilities! What do you think of my 80's perm? tee hee. Good GRIEF!!! And look at Alan's white hair! I was shocked - I'd always dreamed of having a little dark-haired, blue-eyed baby! But his dad has nearly white hair so I guess I did not have the dominate gene! This time I made a little vellum pocket behind which I tucked a little journaling tag. Oh!! Here's one more thing to drool over! Head on over to Michelle's blog to get a sneak peek of just a taste of the bling she's designed to fit exactly on your Nestabilities! She'll be debuting it next week at CHA. It looks delectable for sure, and I hear the prices are going to be veeeery reasonable!!! Welcome to day four of the Spellbinders Paper Arts "To Die For!!" Winter Release Blog Frenzy! Spellbinders™ Paper Arts has been working hard to bring you another selection of the most innovative and beautiful die templates in the world. The To DIE For!! 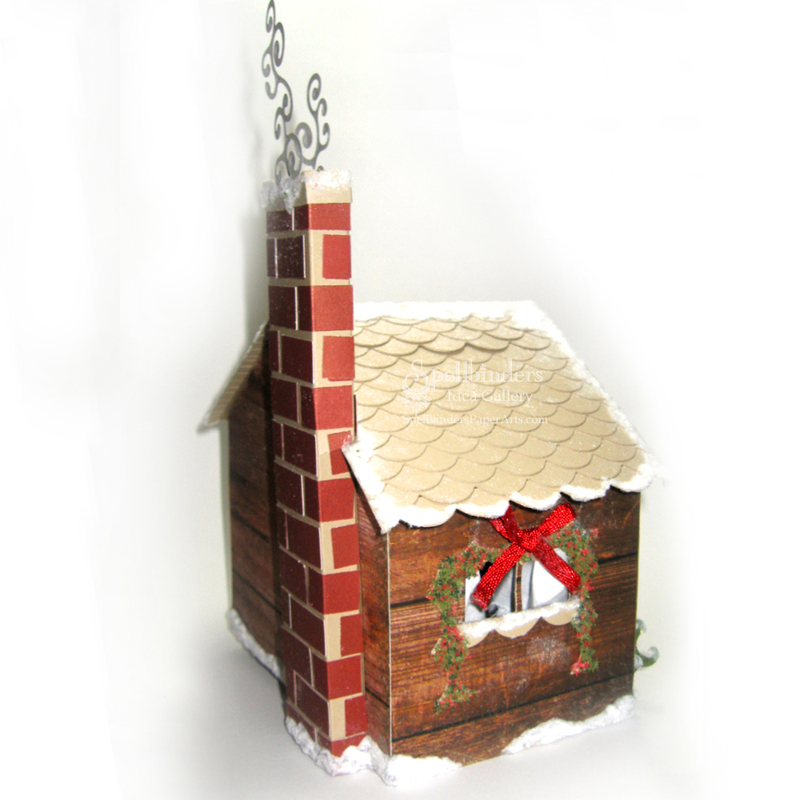 Winter Release Blog Frenzy allows you a sneak peek of the products we’re introducing at the Craft and Hobby Association trade show later this month. The To DIE For!! 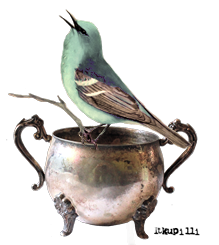 Winter Release Blog Frenzy is from January 10 - 18, featuring 16 fabulous Designers and prizes To DIE For!! You have until 12:01 a.m. January 15, 2011 Central Standard Time to enter my contest. Be sure to read the Official Rules before entering so that your entry will be valid! 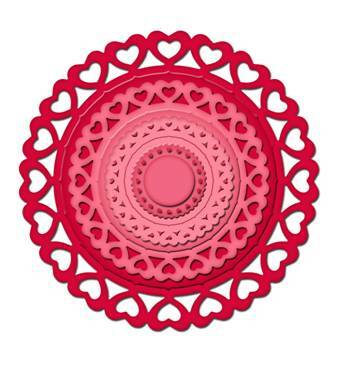 I’m thrilled to share S4-316 Heart Circles Nestabilities(R) Decorative Elements with you! The little heart borders on these die templates made them so much fun to play with! I decided to cut/emboss and stencil as many sizes and colors as I reasonably could on one card! I didn't use the smallest one here, but I did use the largest one twice! Let me show you how! I used S4-316 Heart Circles #4, #3 and #2 (#1 is the smallest) on this project. 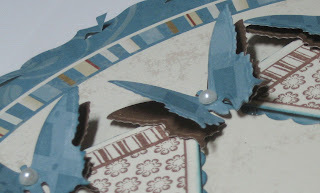 See how I was able to cut all of the die templates with one pass of the GC-001 Grand Calibur. Since I used the largest die template twice (with both red and white paper), I sent it through twice. After I cut and embossed, I then poked out the little extra goodies with my paper piercer. I ended up with some sweet heart confetti - nice! 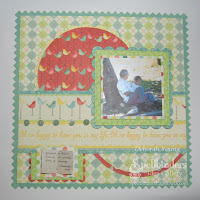 Next I snipped in-between each of the border hearts on the largest white die template. 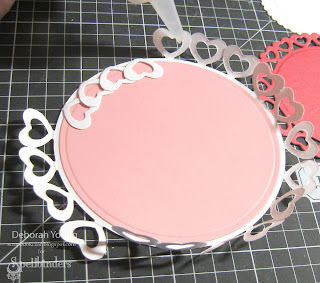 I adhered the pink circle to the center and then folded the little hearts toward the inside of the circle, gluing them down with Zip Dry Paper Glue. I added the pink circle for contrast so that the white hearts would stand out. I used my sponge dauber to stencil red ink through the smaller die template, which instantly gave it a contrasting border! The same ink was used to stamp the sentiment from Waltzingmouse Stamps. I stacked the die templates, using 3D Foam Squares under for dimension. Can you see all of die templates that I cut and embossed? 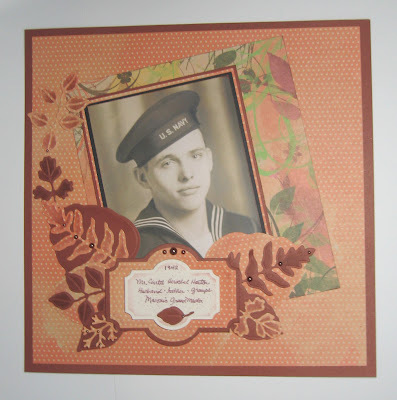 Then I adhered the stack to red and white cardstock that I cut and embossed with LF-126 Grand Squares. Finally, I placed the entire element on some printed paper, wrapped it with a bunch of baker's twine, added a pretty pink button and a card base, and called it a success! 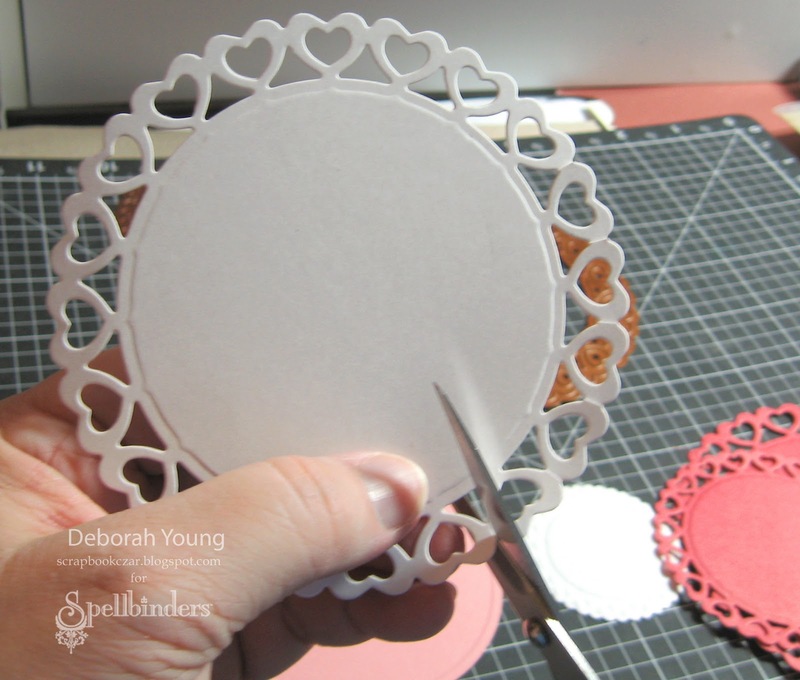 Now, here is a precious project that I dreamed up using S4-316 Heart Circles! Cute, right????!!! While I was folding over the white heart border for the card, I realized that if I stood them up they would make a cute coaster....which I turned into the base for a cupcake liner! See the little heart base at the bottom of each cupcake liner? Yep, that's S4-316 Heart Circles! 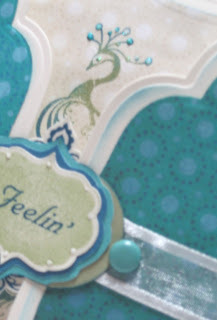 And I pulled out my F-013 Jewel Tones Premium Craft Foil (love it!) 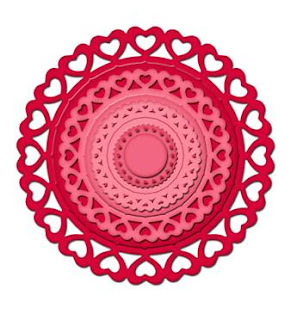 to use with the S4-316 Heart Circles to make the little cupcake picks. These were so much fun to play with! Click here for the Spellbinders Paper Arts To DIE For!! Winter Release Event rules..
TO ENTER MY CONTEST: (Contest is open for entries from 12:01 a.m. January 13, 2011 to 12:01 a.m. January 15, 2011 Central Standard Time). 2) The subject must be S4-316 Heart Circles. 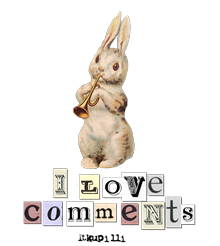 I love your comments! Unfortunately your comment does not count towards a contest entry, so be sure to enter...and then leave a comment! 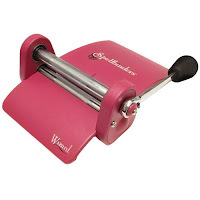 If you have any questions, please e-mail ContestQuestions@Spellbinders.us. 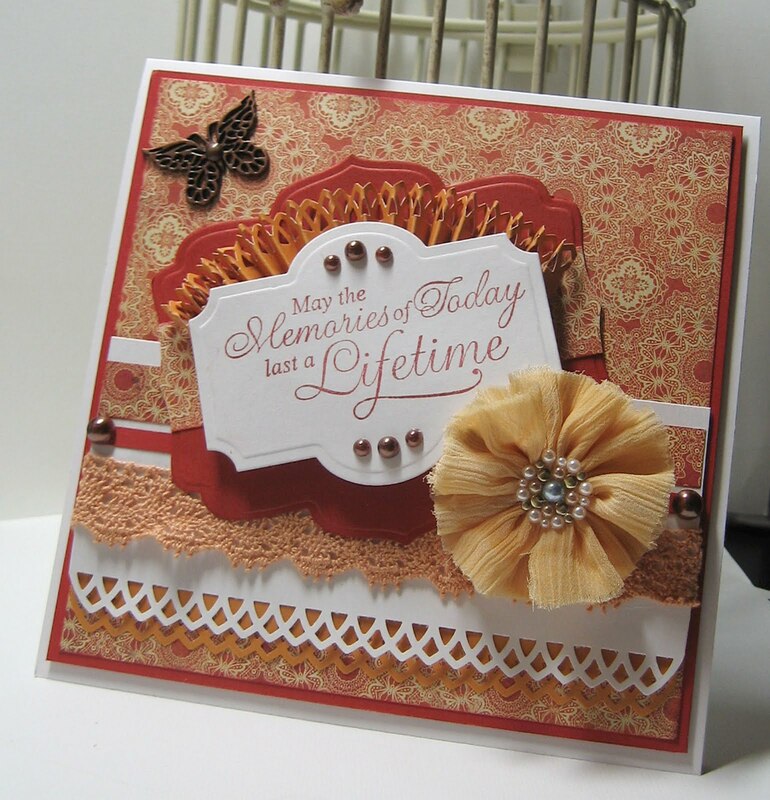 Today's the first day of Spellbinders(TM) Paper Arts "To Die For!" Winter Release Blog Frenzy! 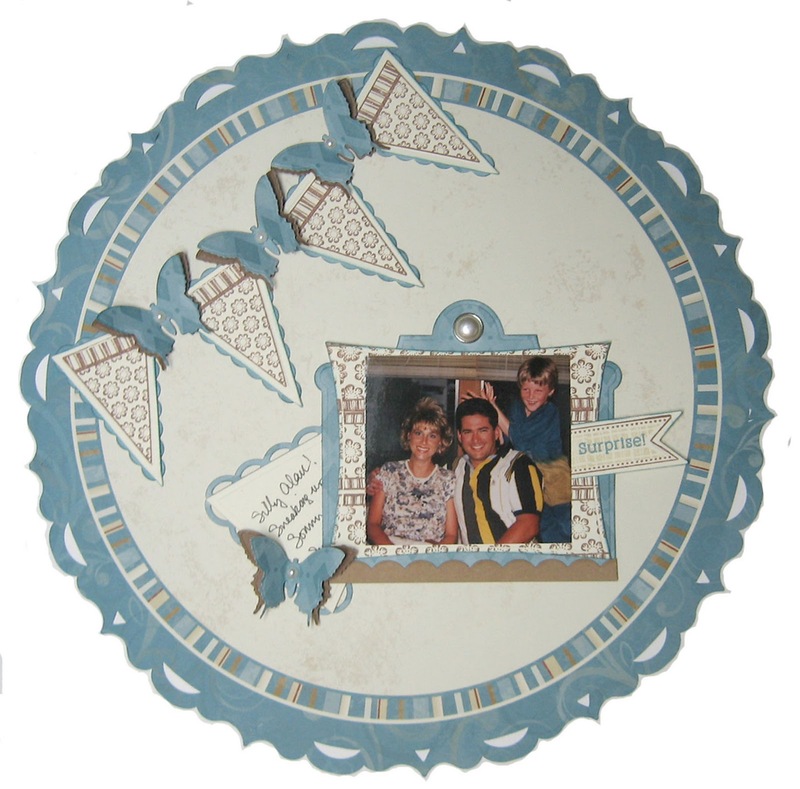 Today's featured designers are Debbie Olsen and Donna Salazar. Make sure you follow the rules to enter for your chance to win! I'll see you Thursday morning with my projects to die for! Free Spellbinders? You heard it here! I want to let you in on a GRAND announcement! Mark you calendar for January 10-18: when I will be participating in Spellbinders(TM) Paper Arts "To Die For!!" 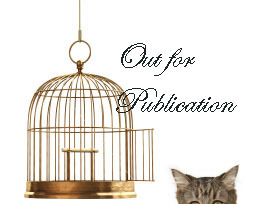 Winter Release Blog Frenzy! WooHOOO!!! You will seriously DIE when you see this new release - it is absolutely the best ever! You will not believe the awesome die templates in this release! It's my favorite so far - and you can win them all! 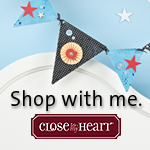 Join me and 15 other designers starting January 10 for a sneak peek and your chance to enter the contest to win! I cannot wait to show you the projects I have been working on! If I sound just a tad excited, it's because I truly am! Oh, I can't wait for you to see! My post is the 13th, but the hop starts here Monday morning. Make sure you enter every day for your chance to win! You would not believe the internet issues I have had. I've been trying to recruit physicians from home but my DSL service is a joke. Then my e-mail started sending out random spam, so I changed all my passwords. Including my Blogger one.....which I couldn't remember....tee hee! My whole life has been a comedy of errors. Anyway, here are a few of my Spellbinders(TM) Christmas projects that have been posted on the Spellbinders' blog, so I can show them to you now! First is a log cabin that I made using several different Spellbinders die templates. The details are here on the blog. There are additional photos and I believe a supply list as well. It was a lot of fun to make! 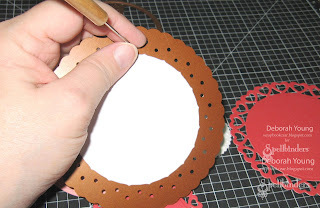 The scalloped die template would make a great gingerbread house roof, wouldn't it? 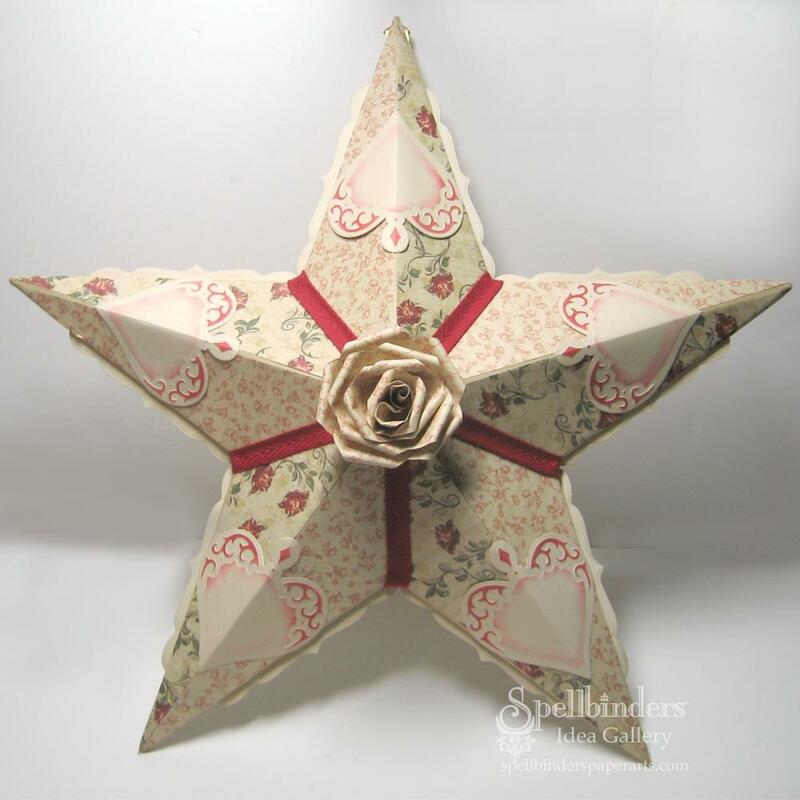 I found these awesome papier maiche stars at Oriental Trading Company last year, so I decided to cover it and decorate it this year (finally - ha!) 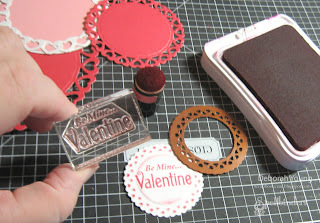 I used the Nested Hearts die templates as well as Labels Fifteen peeking out from the back. The paper is retired from Close To My Heart, but any vintage paper would do nicely. 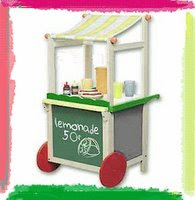 Or take it in another direction by using bright and cheery colors. By the way, you can find my rose tutorial here. My third project features a viola made from Labels Fourteen. And real wood paper - how cool is that! I colored it with Copic Markers and used Doodle Parts to finish the viola handle and vents. 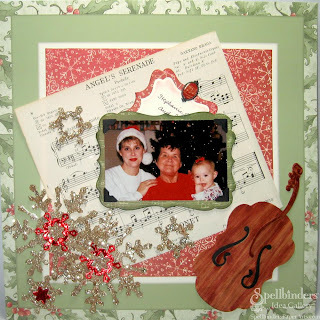 The 2010 Snowflake die template is covered with glitter. What a mess I made! 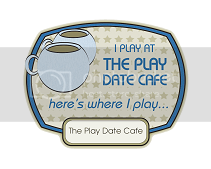 Now, I usually give you all of the SKU numbers, but I am anxious to get this posted. And I am a bit lazy tonight too. Ha. Suffice it to say that you can find all of them here. I was in Gainesville last weekend to celebrate my son graduating (go GATORS)! 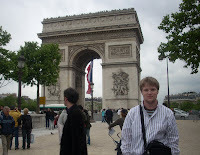 He earned two Bachelor's degrees - one in Physics and one in Astronomy. He is so awesome! Well, I'll be back soon with a couple of more Christmas projects - can you believe it is seriously almost here?